.. Alex Rodriguez [ARod] is appealing his season – long suspension that was handed down by the arbitrator . MLB supports the arb , of course . .. ARod has very little chance of overturning his suspension in court . The courts do not like to intervene in arbitration cases , in any case . They like to do it even less in a case where it is a part of a contract that is freely arrived at and is negotiated in good faith . .. Short of a drastic screw up , the courts will not intervene in an arbitration case situation that is set up by a process that is freely negotiated by a labour union and the management of a company [in this case , MLB as a whole] . There could be a screw up , but i doubt it . The arbitrator has crossed his ” t s ” and dotted his ” i s ” in preparation of his decision . They also do not want the precedent of having sports arbitration decisions becoming legal footballs . Congress has set a very high standard , and the U.S. Supreme Court has ratified it by a strong precedent . .. Case rejected , lack of appeallable subject matter . .. and now , he will pay a price for it . racing , like Winston Cup racing , does not come without risk . .. Unfortunately , he will have time to contemplate the actions and errors of his ways . He broke both his fibia and tibia (presumably in his right leg ; I am not sure which one he broke0 , and he has had surgery to insert a rod in the area of the injury in order for it to heal properly . Evidently , a second surgery is also in the offing . Those injuries will take about 6 to 8 weeks for him to properly heal . Big Problem , though . .. Cup Racing has what is called a “Chase to the Championship , ” in essence a playoff system to spice up the end part of the racing schedule . The Chase begins , however , in about 5 to 6 weeks . Stewart can hire a substitute driver [there are a number that come to mind , such as Boris Said , Brian Vickers , Regan Smith , and the Dillon Brothers (both grandsons of car owner Richard Childress , but up – and – coming drivers nonetheless) , but his sponsors , Bass Pro Shops in particular , that will take a hit . They knew the risk , but are likely not all that thrilled with Tony right now . 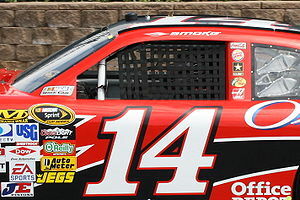 .. Tony Stewart is a rarity , these days . He is a driver – owner , having built Stewart – Haas Racing from the ground up . He has dealt with change . Hopefully , god – willing , he will learn from this . He earned his first Cup title in 2002 , and , believe it or not , almost got fired by his lead sponsor (Home Despot) because of his immature behaviour . He is not like that now . Far from it . .. Stewart is one of Winston Cup ‘ s best examples of both a driver and an owner . He has grown up , especially since putting together his own team , and has become one of the sport ‘ s great ambassadors . Take it easy , Tony . You are one of my favourite drivers , and you should sit it down until you are fully healthy . Find some other and more safer offtime pursuits , because your sponsors will give you grief until you do . There are plenty of them , and he will find them .